Many Star Wars fans (myself included) wanted to own a full-size replica of Luke Skywalker's Landspeeder growing up. Alas, fans had to settle for Kenner's toy vehicle when the first film in George Lucas' space opera was released in 1977. Now, Radio Flyer has announced a kid-sized Landspeeder for the next generation of fans. 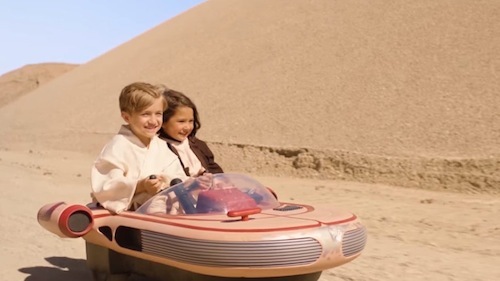 "The first kid-sized Landspeeder you can drive. Luke Skywalker’s Landspeeder™ by Radio Flyer is modelled after the sand-pocked and sun-faded X-34 craft from Star Wars: A New Hope. With seats for 2 riders, an interactive dashboard with lights and real movie sounds, and a 5mph driving speed, this speeder provides a truly galactic driving experience. The gear shift switches between 2mph forward, 5mph forward, or 2mph reverse. 12V rechargeable battery and charger included. For ages 4+, max weight 130 lbs." The attention to detail is incredible and I'm in no way envious of younger fans when this ships from Toys "R" Us following Force Friday II.